The body goes through many changes during pregnancy, and we all know that it’s safe to take a little extra care when it comes to the food we eat, what we drink and the supplements we take. Expectant mothers also need to be more careful when it comes to chemicals and harmful substances they come into contact with, so many women worry about colouring their hair during pregnancy due to the substances which are found in hair dyes. However, according to the NHS, research has shown that it’s totally safe to colour your hair while pregnant. Very high doses of the chemicals found in hair dye can cause harm – but these doses more than exceed the amount you’re exposed to when dying your hair. However, for those who want to err on the side of caution, there are some steps you can take to make sure you’re being as safe as possible when changing your look. Even though the risks are low, we recommend that anyone choosing to dye their hair while pregnant should wait until they are past the 12-week mark, when the risk of chemical substances harming the baby is much lower. If you decide to use a home hair dye kit, there are ways you can reduce potential risks. Is it safe to dye your hair while breastfeeding? Again, the NHS advises that it is safe to dye your hair while breastfeeding, as very few chemicals used in hair dye enter your bloodstream, so they won’t be passed on to your baby. However, if you still feel concerned, you can instead opt for highlights or lowlights to change your look, instead of going for a full head of hair dye, as no colour will actually come into contact with your skin. During pregnancy, the texture of your hair can change completely. It can go from curly and bouncy to lifeless and limp, or from poker straight to a frizz of curls. Although this doesn’t happen to every woman, it’s worth taking note of the changes in your hair so you can adapt your haircare routine. If you notice your hair getting frizzy, make sure you use an intensive hair mask like Osmo Colour Save Radiance Mask. If you notice your hair becoming limp, try Tigi Bed Head Fully Loaded Massive Volume Duo to get back your full, luscious locks. Often, your hair can become much thicker in your second trimester but then can fall out in clumps after your little one is born. If this happens to you, don’t panic! This is an entirely normal consequence of hormonal changes. Your hair will return back to normal soon, and in the meantime you can invest in hair repair products to speed up the process. 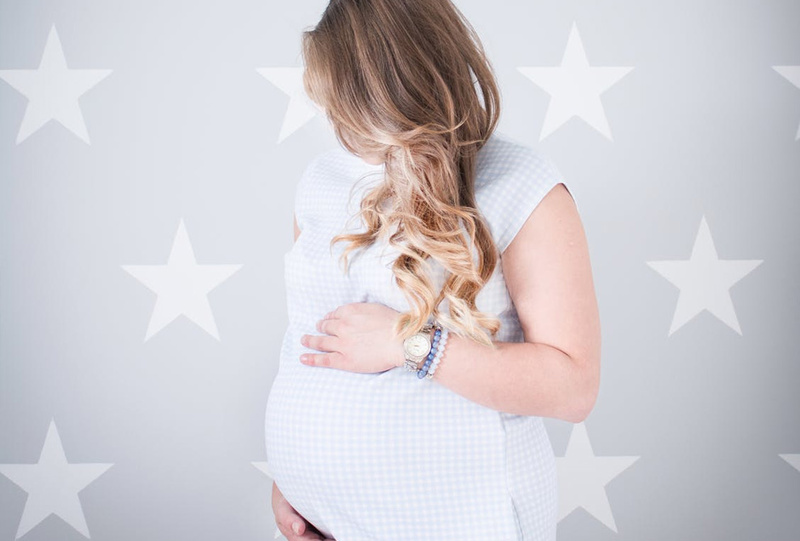 If you look after your hair during pregnancy, you’ll have nothing to worry about, and with a bit of TLC, it will revert back to its normal condition after about six to eight months. For more info on hair care, check out the best oils you can use to help get your hair back to tip-top condition or take a look at the best heat-free hairstyles you can use to create a fuss-free, stylish look quickly.